For the week, silver finished lower by a marginal $0.02 cents or less than 0.2% to close at $15.09 as of the final trade on the New York COMEX on Friday afternoon. The gold to silver ratio thus declined slightly, by less than 0.1 point, to 85.9. The key level we continue to monitor for a breakdown in the ratio remains 80.0 by end-2019, as discussed in this recent article: (https://bullionexchanges.com/blog/2019/02/04/gold-to-silver-ratio-nears-decision-point/). Silver has significant resistance ahead of it at $15.30, which represents the broken recovery channel from the November bottom (turquoise line and red highlight, zoomed-in chart). Further resistance at this exact $15.30 level comes in the form of the short-term downtrend (teal color), which began at the recent February peak. If silver were to break its short-term downtrend, it would then face formidable resistance at the confluence of the rising broken recovery channel (turquoise), and overhead horizontal resistance (black), which will both merge at $15.50 – $15.70 by early-May. Support for silver exists between $14.90 – $15.00, shown in black on the zoomed-in chart. If silver fails at that level, there is no significant support until the recent 2018 lows at $13.90. Our outstanding primary target remains $12.80 (green) unless proven otherwise by a break of the primary (blue) downtrend at $16.50. This target was derived in July 2018 as equal to the amplitude ($2.90) of the descending 2017 – 2018 consolidation (blue), subtracted from the breakdown point of $15.70. Readers will know that we often use the gold mining sector to provide clues as to anticipated price movements for gold itself. Similarly, we monitor the silver mining sector to attempt to gauge likely price movements for the other precious metal. We now turn our attention toward the SIL silver miners ETF. SIL holds stock in approximately 20 silver mining companies simultaneously. This gives a solid representation of what silver price levels are being used by the industry in calculating equity values. The SIL miners fund has broken its primary 2017 – 2019 downtrend (blue) in January 2019. In comparison, silver itself has not broken its related downtrend yet. This is a positive leading signal for the price of silver. Both SIL and silver are below their primary horizontal resistance zones (black). Which come in at 29 – 32 for SIL and $15.60 – $16.10 for silver. Both are properly synced in this respect. 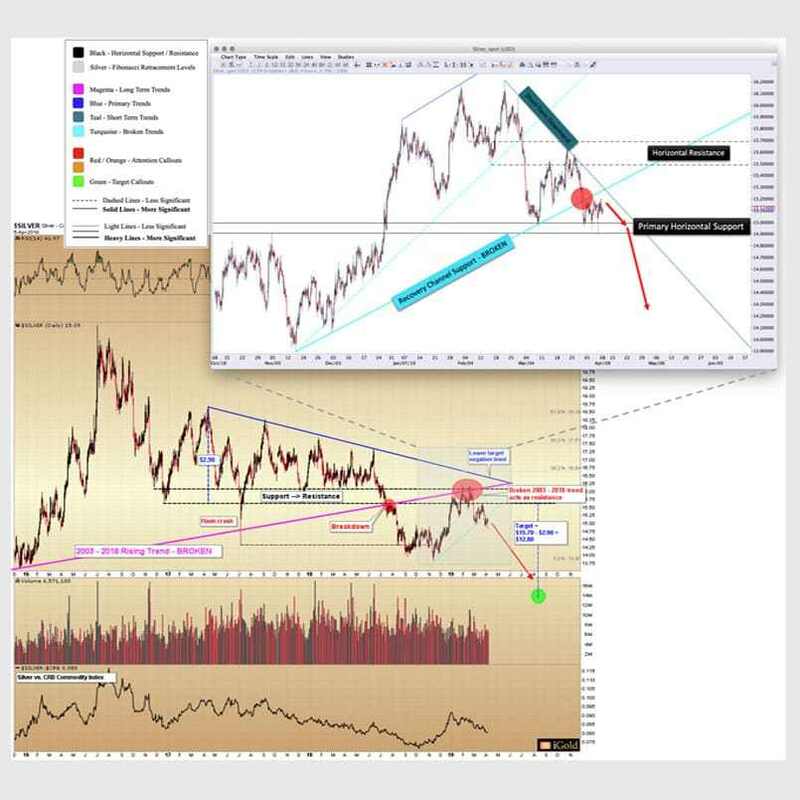 Independent forms of technical analysis (see above) still call for lower silver price. The preferred scenario here is that the SIL miners hold above the downtrend break, which now comes in at 24.8 and declining slightly each week, even as silver declines toward lower targets. Should the miners hold their downtrend break even as silver falls toward our outstanding target, such would set up a positive divergence leading into the silver low. Coming into a multi-month positive divergence signal, we would be looking for a major bottom to form across the silver sector. This could occur as soon as late-2019. The SIL fund is our primary silver mining bellwether going forward. It is representative of the sum of the silver miners’ expectations. SIL has broken its primary downtrend ahead of silver. Yet both remain capped underneath significant horizontal resistance. 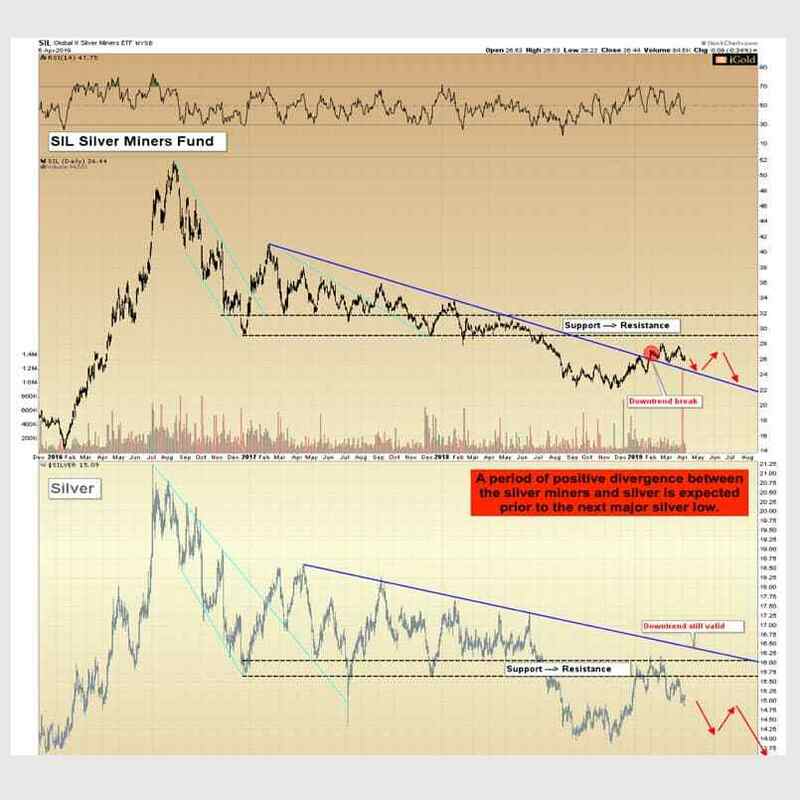 A period of downward-sloped consolidation by the silver mining industry amidst the decline we still expect in silver itself would be a positive leading signal for a major low to set up in the industry over the next 12 months. Christopher Aaron has been trading in the commodity and financial markets since the early 2000’s. He began his career as an intelligence analyst for the Central Intelligence Agency. Christopher Aaron specializes in the creation and interpretation of pattern-of-life mapping in Afghanistan and Iraq. His strategy has helped his clients to identify both long-term market cycles and short-term opportunities for profit. This article is a third party analysis and does not necessarily match the views of Bullion Exchanges. Do not consider Bullion Exchanges as financial advice in any way.